Big, Bold, Beautiful Food: What Did You Make for Super Bowl Sunday? Super Bowl Sunday is a major cook- and eat-fest for a lot of people. Wings, chili, ribs, pizza, bratwurst, chips, lots of Mex or Tex-mex food, and tons of dips, cold or hot. In other words, classic American chow. I wasn't that interested in cooking after mounting several Snow Day Challenges, where my friend Julia and I were posting 7-8 dishes in a 24-hour period. This past Friday, my husband picked up takeout, and I was happy as a clam not to turn on the stove or wash any pots. On Saturday, I sat around in my pajamas all day and devoured a book instead of food. It was divine. I ended up going to the grocery store, firing up the stove and oven, and generating some Super Bowl-worthy dishes. My family was happy. And so was I. How can you not be when you hear, "Wow, Mom, that was outstanding."? I am a sucker for compliments. Super Bowl 2011 Dish #1: Honey mustard spareribs smoked over oak on my indoor smoker. I dry rubbed the rubs with salt, pepper, paprika, and a little ground chipotle. Then I mixed together a couple spoonfuls of dijon mustard with a couple spoonfuls of honey, and a splash of apple cider vinegar, and rubbed that onto the ribs. I smoked the ribs for an hour in my indoor smoker. Then I wrapped them in foil with a little beer and transferred them to a 325 degree oven to cook a couple hours until they were tender. A few minutes under the broiler and they were done. My family is not really a sauce family, so I served the sauce on the side (equal amounts honey and mustard with a splash of vinegar). Super Bowl 2011 Dish #2: Chicken Bites with Buffalo Wing Sauce. The grocery store was cleaned out of chicken wings, so I bought boneless chicken thighs. I cut them into bite-size pieces and tossed them in melted butter and a little mustard. 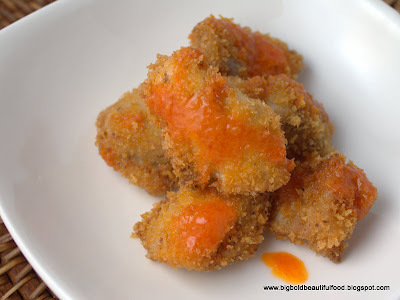 I then breaded them with panko, put them on a baking sheet, sprayed them with olive oil spray, and baked them in a 400 degree oven until they were browned -- 20-30 minutes. I served them with buffalo wing sauce on the side (almost equal parts melted butter and Frank's Red Hot Sauce with a little more hot sauce and a shot of vinegar). Super Bowl 2011 Dish #3: Pita pizzas with Boursin Cheese, caramelized onions, and sauteed mushrooms. 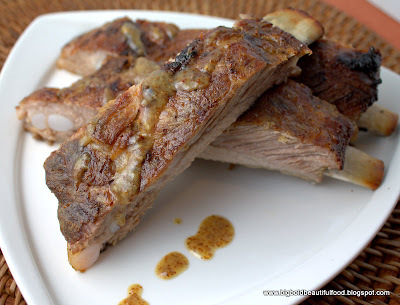 In this heavy meat-eating house, these turned out to be the favorite! I caramelized onions and then sauteed mushrooms in the same pan with shallots, garlic, a dash of wine, balsamic vinegar, and dried thyme. Salt and pepper of course. 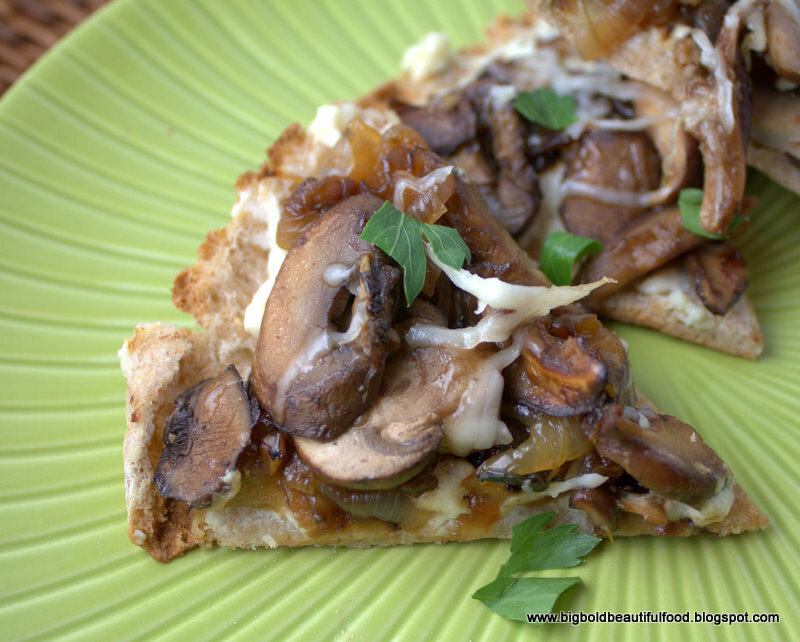 I split pita bread in 1/2, spread Boursin cheese on the bread and topped them with the onions, mushrooms, and a sprinkling of parmesan cheese. Then I threw them under the broiler until they were toasty and cut them into wedges. Very flavorful and yummy. 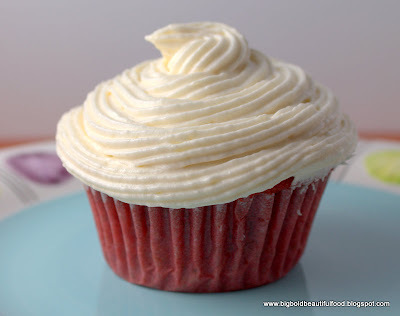 Super Bowl 2011 Dish #4: Red velvet cupcakes with cream cheese frosting. My daughter Christina made these yesterday, and yes, the frosting is also homemade. I'll be posting this recipe soon. 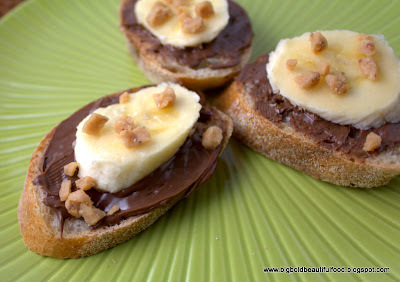 Super Bowl 2011 Dish #5: Nutella on baguette slices with banana and toffee bits. These were in honor of World Nutella Day (2/4/11). Delish! Did you even get out of the kitchen? I only made sliders and little pizza appetizers...they were good though!